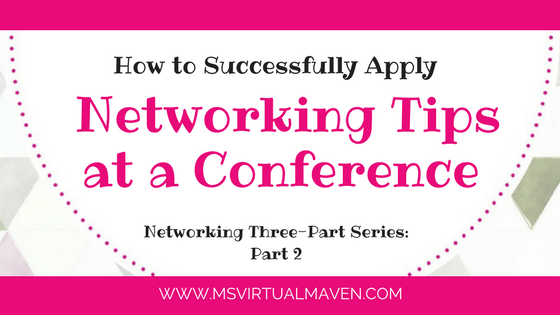 This is the second part of a three-part series on networking at conferences. In particular, the Blogalicious Conference, speakers and events will be featured. There is nothing like the energy of a conference to get you ready to network with people in your industry! This is exactly how I felt as I approached the Blogalicious Conference in Miami. I wasn’t only attending the conference, I was a Social Media Ambassador – sharing conference happenings through my experience. 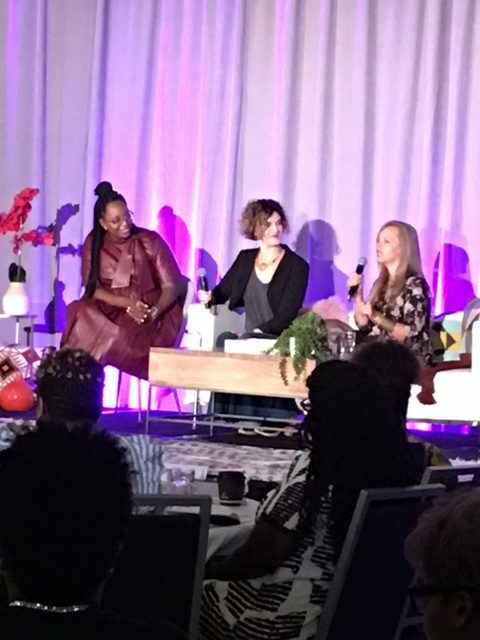 Conferences are a wealth of information, especially if the conference organizer (i.e., Stacey Ferguson, Chief Curator at Blogalicious) puts together great sessions for attendees. However, what is most important is what you do during and after those sessions that’s most important. 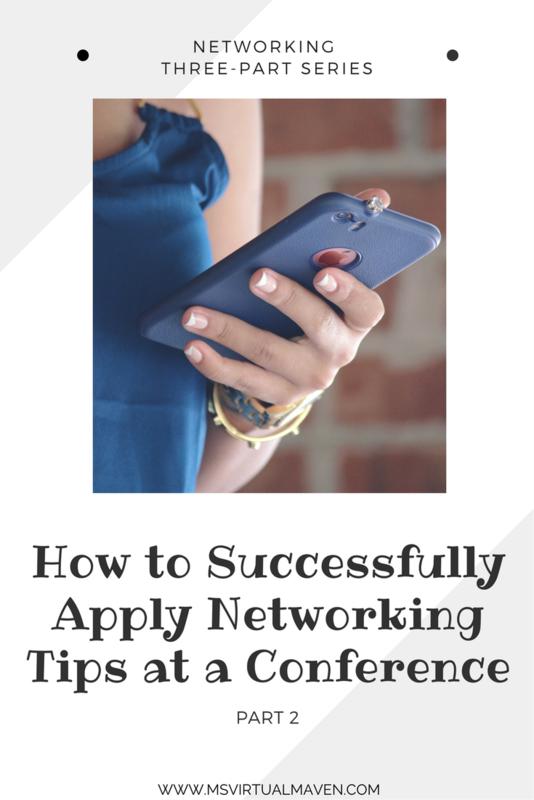 If you remember from the first blog post in this series, there are several steps you should take before a conference. In this post, we are going to apply it! So, let’s start with step 1 – Research! Blogalicious had a host of keynote speakers and presenters. 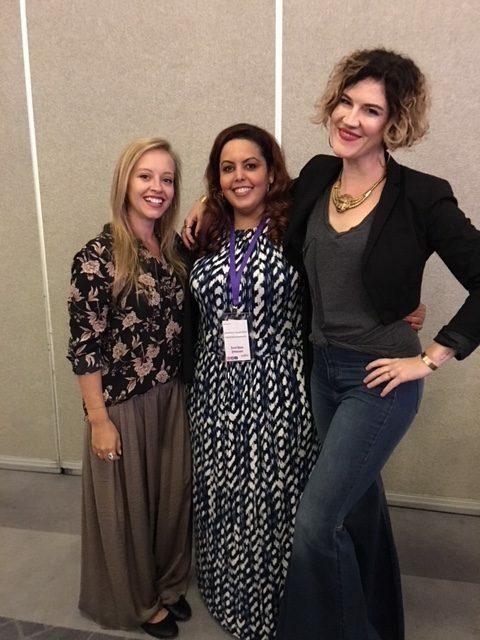 After seeing the agenda online, I knew that I had to meet the fabulous Emily Thompson and Kathleen Shannon of Being Boss – a podcast on a range of topics for Creative Entrepreneurs and Business Owners. My goal was to meet them and do a little fan-girling, but what I got was so much more. I wanted to share how awesome their podcast on the Chalkboard Method for Goal Setting was and possibly ask a few questions on creating podcast content. As they were on the main stage sharing their story on how this dynamic duo came together, I became immersed in how their collaboration turned into a profitable joint venture. It made me think of the collaborations I have made throughout my time as an entrepreneur. One of them is managing a Facebook group on Networking with my biz bestie, Patti Haus – a Communications and Digital Marketing Strategist I met at a conference, of all places. Some of the other goals was to network with as many bloggers and influencers possible. Listening to bloggers / social media influencers pays two-fold – I’m able to listen to their passion of their brand and hearing their struggles and obstacles in operating their business. Listening to their pain points and struggles helps me find solutions for them, either sharing through conversation, social media DMs, or creating content that would help them and others facing that same issue. 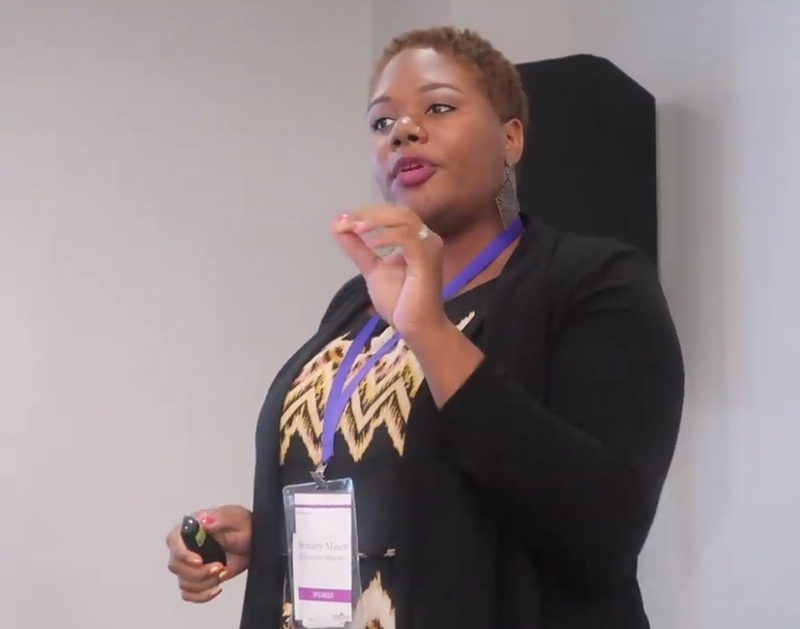 My elevator pitch came in handy here, as I shared how I find business and social media solutions for business entrepreneurs. I was able to discuss the power of Pinterest, share Social Media strategies and digital marketing ideas to innovatively sell their products. There were so many Power Shares, not so many power ups! These attendees were ready with their own power supplies – they are pros at conserving and powering up devices they use on a daily basis. However, the power ups were amazing. Power Shares, just to refresh your memory from the first blog post in this series – are the golden pieces of information from a session or keynote. 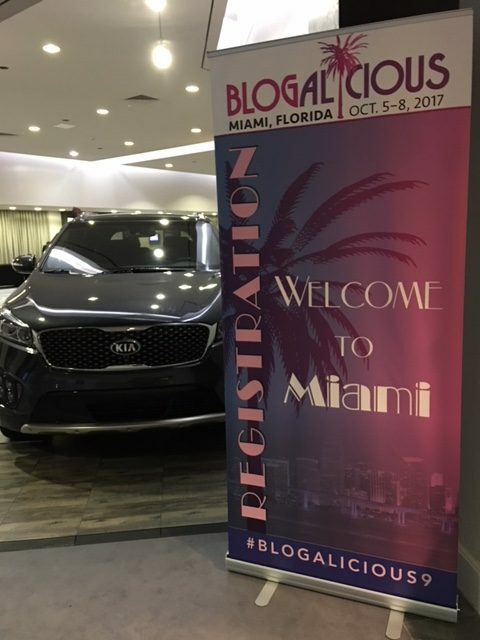 If you pop onto your social media and type in #Blogalicious9, you will see the countless amounts of Power Shares from everyone at the conference. Power Shares from @msvirtualmaven on Twitter! However, one Power Share I took away from the Conference was building and maintaining relationships can help you achieve your goals/dreams. It was a consistent theme that collaborations, even with your competitors, will help you get to that goal – from putting on a conference, starting a podcast, and getting sponsors to support your vision. One person in particular has supported my vision since meeting her at a conference this past summer. Brittany Minor, of Clumps of Mascara, suggested I attend this conference. I had no idea she was presenting a session on Creating a Community When You’re Introverted and Awkward AF. Even though I wouldn’t consider myself introverted, she gave me some insight on how I can be of better service to those in my circle that might be! Brittany Minor, from Clumps of Mascara, sharing tips at her session! This is one conference that I did not have to remind myself to pull away from work mode and have fun. 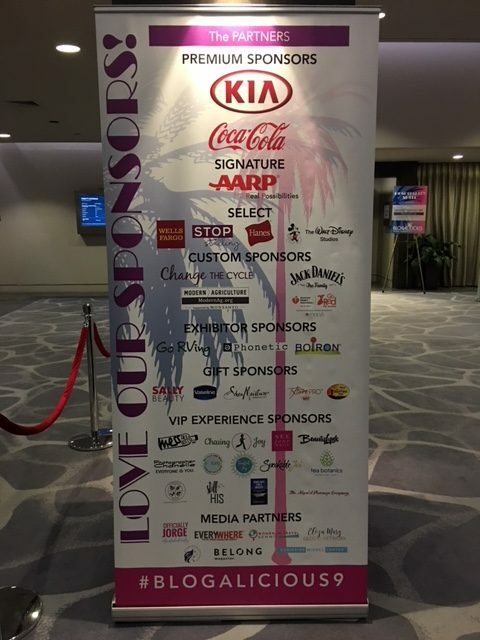 I have to admit that every facet was thought of for the attendees at this conference – yoga in the morning, test drives with Kia (with a bonus Sephora gift card – Yes! Sephora), smoothie breaks, camp side chats about RV life with Keith Sims and Go RVing, silent disco sponsored by the American Heart Association, happy hours with #FriendsofJack – Jack Daniel’s, and makeup touchups and headshots sponsored by Wells Fargo Works. This was all onsite and amazing! I found myself connecting with others based on just being social and having fun, not necessarily just to pitch or promote. It was connecting and building relationships with others based on common interest, business aspirations and life goals. It’s hard to believe how much social media is needed to help boost your status, A lot of people aren’t aware of that. What a great opportunity it was for you to be able to reach out and show/help them improve in the world of technology. Networking in the business world is key. I can’t image having a successful career without all the people I have met throughout! Completely agree with you! Having a community is so important for success. Super awesome tips! For me research is always a big part of my prep for any conference. knowing where I want to be the most and who I need to see is so helpful in taking away the most. Yes! Completely agree with you. Feel free to check out the first part in the series. Has some more helpful tips. This sounds like an amazing event. I would agree with being natural, have fun to do networking instead of being so pinpointing on just advertising and promoting. Yes – No one likes to be pitched at in this type of setting, including myself. Getting to know the person and building relationships is always key. I’ve never heard about power shares until I read your article. Thanks for that tip! And elevator pitches are so important. I’ve learned that you need to distill your “sell” into 10 seconds of important words. I’ll now be looking for more “power shares” and other cool info from you. Aww, thanks! It is something I came up with during one of the many conferences I’ve attended in my career. I look forward to sharing and hearing about your power shares! Cheers! What an amazing experience, I’ve never been to a blogging event but they always look so much fun and like a great way to learn from those know are suceeding in what they aspire to do. Fantastic that you got to meet so many awesome people and learn so much! I definitely recommend attending events with like-minded people. There is no limit to what you can learn and share. Definitely attend a blogging conference if you have an opportunity. In the meantime, my recommendation is to start a small group or get-together in your area. There might be someone feeling the same you are without realizing that there is someone else with the same interest. Two very important pointers- research before and follow up after. Make it about the person and they will remember you. Couldn’t agree more to you. Social media is very much necessary to unleash your brand potential and also to get in touch with others quickly and in a more personal way than emails. Social media can be an effective tool if used strategically. Glad you liked the post. Feel free to sign up for updates or return for future posts on networking and social media. Networking can be fun! I like learning about other industries and hearing what people do, plus making new friends! Oh, I never knew about such a conference! I’d love to attend the next one. I love how through blogging you can get to know someone. And it’s true, sometimes when attending conferences, just have fun- work mode can be incorporated somewhere in there! Networking is one of the most important thing in business! It’s always important to network, no matter where you are, especially when you are working in a digital world!